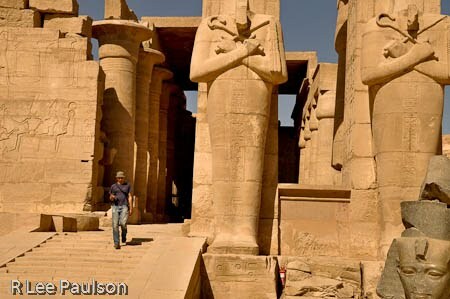 At any rate,West claims that "it was here that storehouses in ancient times held the finished treasures of Egypt: furniture, unguents, musical instruments, jewelry, etc., in other words the fruits of all that transformational earthly creative activity." Sheahan comes out the front. 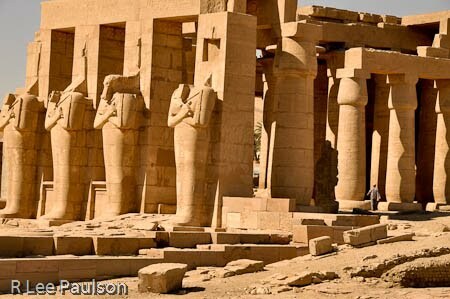 Notice the scenes, to the left of him, carved into the front of the temple in ways similar to that seen at the Temple of Luxor. The 'battle' of Kadesh is shown on that wall. Again, on the outside of the temple walls, (not shown) we find scenes of the battle of Kadesh, reinforcing the theme that only those who had mastery of their inner, unruly selves, were allowed to enter. Mike walks through a covered part of the temple. Notice the original paving stones are still in place. Also notice the birds sitting on top of the columns above and to his left. Again and again we see the theme of transformation. 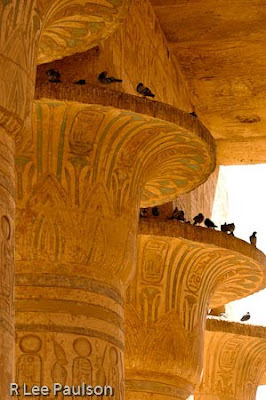 For the ancients, the symbolism was all linked together. Take the raw materials of one's soul and transform them by mastery of one's thoughts. Then, using one's mastery of self and mastery of talents, transform the raw materials of the earth into objects of beauty. Eventually, return with one's soul as an object of beauty back to The One. That's the Cliff Notes version, of course. The actual mythological details were somewhat more involved. The lighting was terrible, here, but my trusty zoom lens came in handy once again. Notice the color on the columns that still remains. When a temple was torn down by the ancients, it was done for symbolic reasons. Its planned lifespan had come to an end. The symbolic rebirth and resurrection part of the ancient's symbolism can be seen by noticing that pieces from the older temple were placed prominently in the new, for example under columns, symbolically showing that the new column grew out of seeds from the old--just as in nature. Some of the symbolism that West point out to us was very, very subtle. But all of it revolved around these same themes at all different levels. 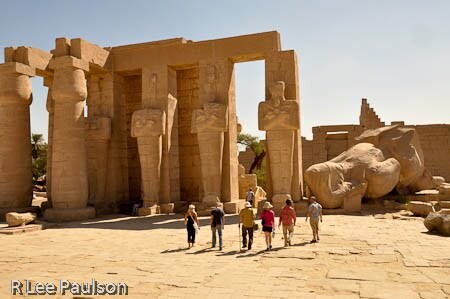 Here the group walks out into the courtyard where the fallen colossus lays in ruins. Notice the doorway between the right most figures. 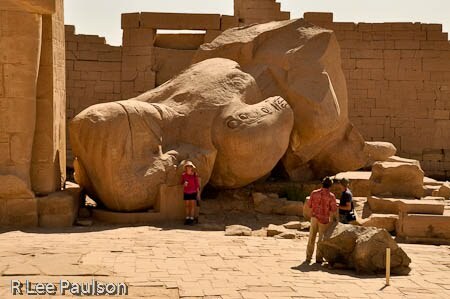 The fallen colossus was made out of red granite, quarried in Aswan, then floated down the Nile 300 miles or so. 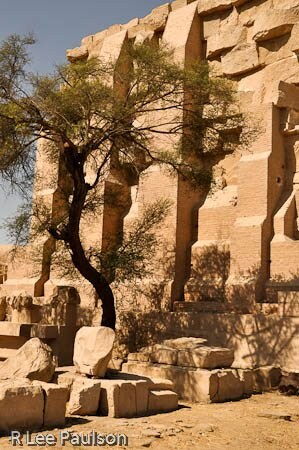 It is believed to have fallen during an earthquake that occurred in 27 BC. Oddly, the entire temple was not destroyed in that earthquake. Only one side, the side where the colossus happened to be. To give you an idea of the original size, the ear on the figure's head was three feet high. 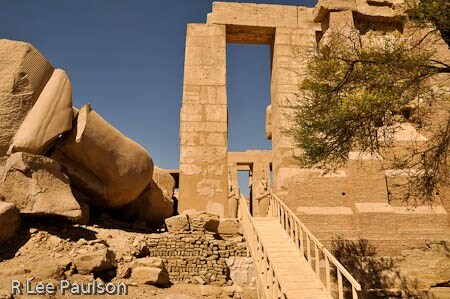 This is the other side of the doorway shown above with the fallen colossus on the left. From here, it looks like a doorway to nowhere. Another view of the tree on that side. From here, one gets an entirely different sense of the same side of the temple. Which illustrates, yet again, how difficult it is to present an accurate overview of places like this using only photographs. ...and had to take another picture. 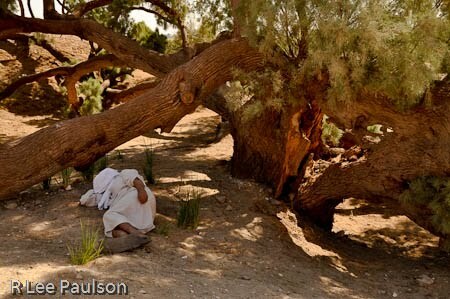 Notice how the tree has split. That tree has a story to tell us and so, I bet, does the sleeping man. Next time, we visit Queen Hatshepsut's Temple. 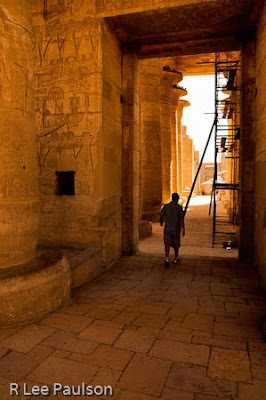 Continue on to Post 28: Temple of Hatshepsut by clicking here.